When I bike on the Red Rock Canyon scenic loop, I'm thankful more people don't know about this place. When I was visiting Las Vegas annually for the Interbike trade show, I never even knew red Rock Canyon existed. It makes me wonder how many inspiring places and people I have not encountered because I am just not curious enough to explore. Just as I was about to enter the scenic loop off, I met ultra marathon runner Molly Sheridan, who began running marathons at age 48 ten years ago and now runs a running event organizer business. I wrote a profile of Molly only two months ago for the Review-Journal. Then, it off to the scenic loop. Enjoy your four-pack of photos. Busy day on the Loop -- more bicyclists than cars. Oh yes, highest [point right here at elevation 4,771 feet. Side selfie with dose of The Big Stripe. Ended the day with a Red Rock Canyon mountain bike ride, offering views of the scenic loop. Nothing like the zoom lens to show you how beautiful it is to bike Red Rock Canyon. The Summerlin sprawl means that there will be roads that are built, but closed to cars during the house construction phase. But the closed roads sure make great places to ride a bicycle. As RJ star photographer Kevin Cannon finds out Saturday. Time for a Hi 5! 1. In Toronto, a property management company removes a bicycle from a pole on a public sidewalk. Reminds me of El Cortez banning people from locking bicycles on a public sidewalk in downtown Las Vegas. 2. Whoa nellie! Check out Copenhagen's elevated bicycle path. 3. This fella riding a bike in Ashland, Oregon was cited by police for riding in the traffic lane and not the bike lane. 4. Nice to hear that there's a bicycle crackdown in New York City. Maybe start with this NYPD officer standing in the middle of a bike lane in midtown. 5. When Interbike and the bicycle industry come to Vegas, there's a whole bunch of great bike events -- like the Las Vegas Pedal Palooza crits in downtown. Tonight I took a four-mile stroll into the new housing development being built further west of where I live in Summerlin. And I inevitably see bicyclists on all my walk. Like these guys on mountain bikes, who made the smart move and didn't try to ride their rigs down a set of concrete steps into their neighborhood -- especially when one of them had a trailer with a little kid inside. I'm lucky to live around the corner from this. People from around the West make a pilgrimage to Red Rock Canyon. It's a morning bike ride for me and for that I am grateful. He loved bicycles. He was a good guy. It was time to bike Red Rock Canyon this morning and check out a new Nikon Cool Pix camera. No more iPhone5 photos. When the temp dips to a frigid 64 degrees in August in Las Vegas, you know it's going to be a great bicycle ride through Red Rock Canyon. Got up early and the hit the road at 5:40 am and there were lots of walkers out there in Summerlin enjoying the unusual cool temps. Lovely ride to Blue Diamond and back this morning, with other riders along the way. In Blue Diamond, there were some muddy sections caused by Monday's rainy deluge that struck the Las Vegas valley. GRAND CANYON NORTH RIM -- They came pedaling toward the finish together, father and son, completing an exhaustive 56-mile mountain bike ride along the single-track routes that snake their way through the evergreens and rolling terrain that lead to the Grand Canyon's scenic North Rim. Mark Uhlrich, 48, and son Luke Uhlrich, 12, were overjoyed at the finish, sharing laughs and high fives with Jared Fisher, owner of the Las Vegas Cyclery bike shop and Escape Adventures bike touring company. "We've been riding all summer. It was very challenging. At about the 42-mile mark, Luke was about to shut it down. He was suffering mightily," Mark Uhlrich said at the finish at the U.S. Forest Service DeMotte Campground. "But we persisted and finished," the proud papa said. Some bike shop owners have sale events. Others put on local bike rides. Jared Fisher does all that -- and more. Like putting on the inaugural Grand Canyon Fat Tire Festival at the North Rim from Friday to today. "I love the North Rim because it's so remote. The grassy meadows beckon me back to the back country," said Fisher, who launched the mountain bike weekend and race only a few months ago. "The view points on the North Rim -- you can't beat that," he said. The father-son Uhlrich duo were just two of the 60 mountain bikers who pedaled the 100-mile ride or the 56-miler through the beautiful Kaibab National Forest, which featured miles and miles of dirt roads and single-track routes. Jared and his wife Heather pieced together a challenging course that featured scenic fingers of land and view points like Locust, Timp and North Timp Points that jutted into the North Rim. They enlisted about 15 staffers, plus their three sons and a few friends, to put on a three-day event, which impressed the riders for the quality of the course, the abundant and tasty food and live music at the National Forest's DeMotte Campground. Around 3 p.m., the 100-mile riders were slowly trickling through and Jared Fisher was sure to greet every one with a high five, a pat on the back and a medal. "Hey, don't ride too far and go back to Vegas. 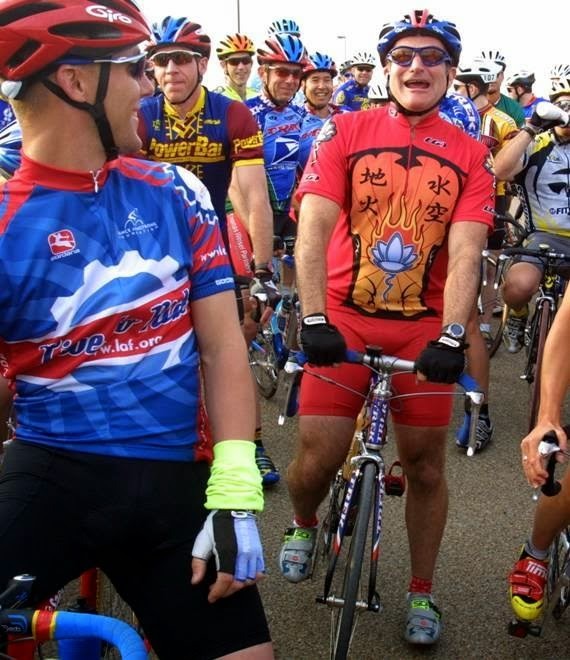 We have a party here," Fisher joked to one finisher who pedaled through the finish line. "I love doing these 100-milers," said Rob Campbell, 43, of Kensington, Maryland, who was in the area and heard about the fat tire festival. "It's tough, but it had beautiful viewpoints." Mountain biker Scott Winzeler, 54, of Las Vegas, had never visited the Grand Canyon until he entered the fat tire festival ride. "This is my first time to the Grand Canyon and who would have thought these views existed on the North Rim," said Winzeler, a gaming industry employee. "I went over to see the buffalo, the sunset over the North Rim and then I tortured myself for eight hours today." William Lefkovics is a road-riding racer, but he wanted to ride his second-ever mountain bike ride. He got caught in a downpour on the course and arrived on a mud-coated bike. "It was worth the four-hour drive," said Lefkovics, technical director for History: nevada. Jason Bean, a photographer at the Las Vegas Review-Journal, has crowed about the amazing mountain biking in the national forest and the free primitive camping that is available in Kaibab. A particular view point that offers spectacular vistas in Locust Point, where you can drive about 20 miles on a dirt road to camp sites that are literally just a few feet from the rim. A Las Vegas Cyclery/Escape Adventures event always delivers tasty food at events. Such was the case this weekend, as staffers cooked up burgers, including veggie patties, a ton of fixings after the Saturday afternoon race and great pancakes for Sunday breakfast during an overcast, misty morning. It was a tremendous weekend for celebrating mountain biking and another great first-time event put on by the folks at Las Vegas Cyclery and Escape Adventures. The DeMotte Campground in the forest land is only four miles from the start of the U.S. Parks Service entrance into the Grand Canyon North Rim -- and then another 12 miles from Grand Canyon Lodge, a historic and rustic base for tourists that dates back to the 1920s. It's a mellow version of the lodging facilities on the South Rim. If you pay a mountain biking visit to the forest land, it's worth a quick side trip into the parks service area and a visit into the Grand Canyon Lodge, where there are about 220 cabins and rooms; a small dining room with rim-front vistas and a small saloon that has craft beers and snack food like pizza.